1. cut out some churn dash blocks for My Small World - using these as leaders and enders as I sew other stuff. 2. 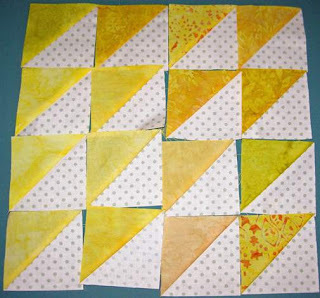 Made nine blocks for another baby quilt using the disappearing four patch idea. 3. 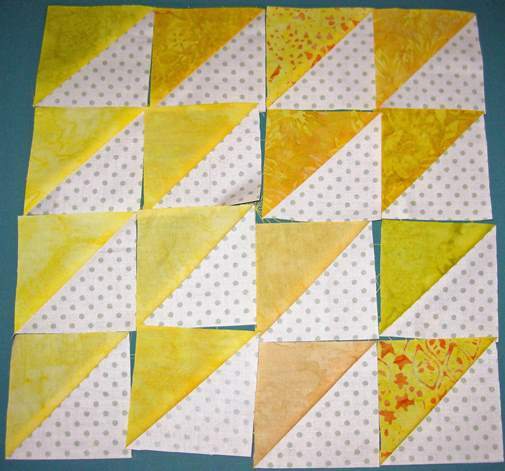 Made some yellow HSTs for my Meadow project and RSC 2018. 4. and of course Lady Liberty (see previous post). That bit of work used up 1.35 yards. New YTD total equals 18.88 yds of the 28 yds I should have used by now. How did you do? I'll be working on my Anna's Garden block with hand applique. Almost done with it and then I'll start working on my Bliss again. 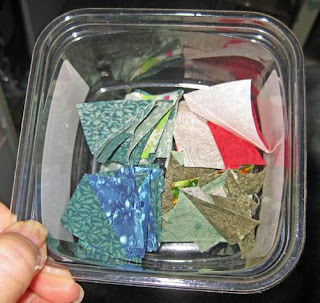 I'm linking to Kathy's Slow Sunday Stitching, Cynthia's Oh Scrap, Angela's RSC Challenge, and Sunday Stash. See you there. The yellow blocks are very happy. The pieces in the container are so small. Good luck with those. Love your yellow hst. So cheery. Leader ender projects are fun - as is your yellow project! Those are some tiny pieces! Thanks for sharing with Oh Scrap! You are doing better than I! What great fabric use, too. I love your yellow HST. Those are some small HSTs. Sounds like you are keeping up with all your WIPs. All fun projects. Slow and easy wins the race!